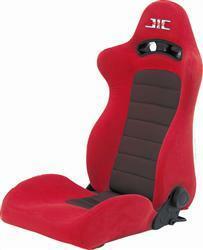 JIC Reclinable Racing Seat is ideal for the enthusiast that seeks comfort, performance, and style for every day driving. The reclinable racing seats are wrapped in an Alcantra anti-slip fabric, insulated with comfortable memory foam, and keep the driver in place with a breathable mesh down the middle of the seat. High side bolsters keep the driver in place while wide should bolsters aid the driver from excessively moving around. A strong metal skeleton keeps the seat ridgid and stable. Side knobs allow the driver to precisely adjust the seat with ease. With all these added features, JIC was still able to keep each seat under 12kg. Available in 3 color options: Full red with red center mesh, full black with black center mesh, and black with red center mesh. A high quality embroidered ‘JIC MAGIC’ logo is stitched into the head of the seat to show everyone that you have one of the most unique reclinable racing seat available.